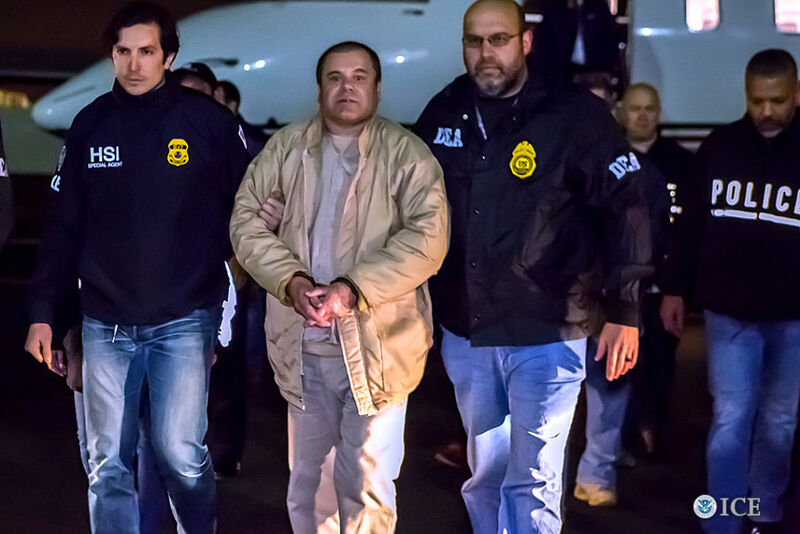 The ongoing trial of Joaquín “El Chapo” Guzmán, which got underway in federal court in Brooklyn two weeks ago, has brought the brutal contours of the Mexican drug war to the center of US media attention. El Chapo, the world’s most infamous drug lord, has long run the Sinaloa drug trafficking organization (still the largest such organization in Mexico), with his partner, Ismael “El Mayo” Zambada, who remains at large. Prosecutors are relying on a number of witnesses they have flipped within the Sinaloa organization, including Jesús “El Rey” Zambada, brother to El Mayo, who was arrested in 2008 and is now the US government’s star witness. Over the course of last week, Zambada testified to a staggering level of violence and corruption, revealing millions of dollars in bribes and dozens of killings. But while these revelations mean that the US media will briefly turn its titillated gaze toward the havoc that US drug habits have wreaked in Latin America, the trial of El Chapo is not intended to reveal the truth about the so-called “war on drugs.” Just the opposite. It’s a last-gasp effort to salvage the reputation of a failing war that has cost hundreds of thousands of lives — a war that has been justified through a series of dissimulations, half-truths, and outright lies about how drugs are trafficked, why violence has skyrocketed, and who does the “organizing” of organized crime. The cartel story — in which small-time traffickers get together and through entrepreneurial verve, mafia ethics, and unchecked violence build massively rich, highly centralized, vertically integrated drug cartels — is one that has long fascinated us. The trouble is, this cartel story is not just wrong — it’s the first lie of the war on drugs. The truth, then, is not that an organization like Sinaloa is leaderless or unorganized — it’s that drug trafficking is flexible and adaptable, mutating to meet market opportunities and challenges. Rather than a pyramid-shaped “cartel,” a drug trafficking organization is more like a loose network of nodes, stretching across the supply chain from source countries to consumption markets — and in a country like Mexico, there are many such networks, sometimes overlapping and sometimes fracturing in territory and allegiance. This means that when one node is removed, new actors quickly move to fill it, often battling for the privilege with spectacularly violent results. The cartel story told by prosecutors and echoed in media accounts not only reinforces the idea that law enforcement can accurately diagram the power structure of these organizations and can therefore dismantle them. It also implies that such dismantling would make a dent in the flow of drugs northward. This has been the strategy for decades now, as US-backed agencies have moved on kingpins, from Pablo Escobar to Miguel Ángel Félix Gallardo to Guzmán himself, as well as their subordinates. And yet, somehow, the drugs keep coming. The second lie being peddled in Brooklyn federal court concerns the sources of drug war violence. Coverage of Zamada’s testimony late last week took particular note of El Chapo’s nonchalant and “petty” brutality, ordering a rival killed, for example, for refusing to shake his hand. While such incidents surely make for great storytelling — you can almost hear the screenplay for the next season of Narcos being written in the courtroom — they imply that the main source of drug war violence is the wounded pride or ruthless avarice of traffickers. Such a perspective in turn, implies that drug war violence is a problem of bad guys killing other bad guys — a perspective pushed by Mexican officials since Felipe Calderón launched his “war on drugs and organized crime” in 2007. Before Calderón sent the military into the streets of Mexican cities, Mexico’s murder rate was declining; by 2011, four years into Calderón’s US-supported war, it had more than doubled, and has since risen even higher. Conservative estimates are that, to date, nearly two hundred thousand people have been killed since Calderón initiated this war, and the Mexican government has officially registered more than thirty-four thousand people who have been forcibly disappeared. Activists say both of these numbers are likely much higher, and volunteer groups and human rights organizations continue to uncover hundreds of mass graves dotting the country. Grieving families have had to endure the stinging condescension of Mexican leaders, telling them that their dead or disappeared loved ones wouldn’t have been targeted if they weren’t involved in drugs. Tens of thousands of murdered Mexican youth have been given no chance, in death, to defend themselves from charges of delinquency. What’s more, a host of high-profile atrocities committed by Mexican security forces — Tlatlaya, Apatzingán, Tanhuato, and Ayotzinapa, to name just a few — have made clear that the Mexican military and police forces have not just exacerbated drug-war violence, they have themselves perpetuated it. They have done so against not just those supposedly involved in the drug trade, but against ordinary people and dissenting activists, and then attempted to cover it up, staging fake firefights and giving false testimony. So the truth is that while the Mexican government argues that it is fighting this war to reduce drug violence by taking out the gangsters in charge, with their petty feuds and hot tempers, the militarization of Mexican society has served only to spectacularly escalate it. As political scientist Angélica Durán-Martinez has recently argued, drug violence occurs not just when there are competitive markets for rival groups to fight over, but when the cohesion of the state is undermined. As lines of state authority become less clear — with soldiers on the street acting as cops, for example — violence increases. This points to the third and most important lie of the drug war, one very nearly undermined at the trial of El Chapo — the role of the state as the “organization” in organized crime. Durán-Martinez describes two ways that a cohesive state can prevent drug violence: either through effectively repressing drug trafficking organizations, or through offering them protection. In Mexico, such protection has long been provided at the state, local, and, as we began to see in Zambada’s testimony, federal levels. During the long period when Mexico was a one-party state under the Institutional Revolutionary Party (PRI), protection for drug trafficking organizations was supplied by PRI-controlled government structures. This “Pax Priista” had clear lines of authority, with the officials taking a sizable cut of the profits from the organizations moving drugs through their local plaza. But just as the drug trafficking organizations themselves were splintering after the 1993 arrest of Miguel Ángel Félix Gallardo, the “godfather” of Guadalajara, the opposition right-wing National Action Party (PAN) began to win power, first in local and state elections and then finally at the presidential level in 2000. The lines of authority — and the concomitant chain of payoffs necessary for protection — became more complicated. But a curious thing happened on the way to the drug war democracy, as state officials themselves sought to curtail disorganization by favoring some trafficking groups more than others. Mexican journalists like Anabel Hernández have long argued that both PRI and PAN officials — up to and including presidents — have offered protection to Sinaloa in a bid to go after its rival groups. And there are allegations that the Mexican state wasn’t alone in this strategy. In 2014, the Mexican newspaper El Universal published documents showing that the DEA had secured cooperation from Sinaloa operatives that would allow them to continue their trafficking activities in exchange for intelligence on rival groups. The prosecution in El Chapo’s case is now relying on precisely these cooperators. For a brief moment, then, it seemed as though the trial of El Chapo might inadvertently disclose some of the deeper truths of the drug war — but the US government moved quickly to keep such information under seal and out of the public record. While evidence of state complicity in the drug trade has been widely reported and debated in Mexico for years, having these corruption allegations made under oath in a US federal court, and published in the US media, would put extra pressure on the incoming government of Andres Manuel López Obrador, known as AMLO, to go after those who have been involved. Already, in advance of AMLO taking office this Saturday, a debate is raging in Mexico about how zealous his administration should be in prosecuting high-level members of the outgoing administration. In Brooklyn, the trial of El Chapo Guzmán will continue this week, telling its cartel stories. The spectacle of locking up El Chapo will do precious little to change the volume, price, or purity of drugs flowing into the United States — but a conviction will be narrated as a victory, in a desperate bid to justify a failing and forever war. The real nature of drug trafficking and the economic logics behind it, the horrific human consequences of militarization, and the role of the state as the organizer of organized crime: these truths will remain outside the courtroom. Christy Thornton is an assistant professor in sociology and Latin American studies at Johns Hopkins University.